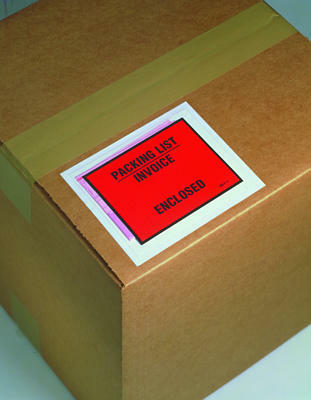 Pressure sensitive polyethylene envelope printed across the face with Packing List/Invoice Enclosed. * Choice of 4 1/2 inch x 5 1/2 inch or 7 inch x 5 1/2 inch envelopes. High-quality printing focuses attention on your documents. High tack, hot melt adhesive technology keeps the Packing List Envelope in place even through a wide range of temperatures and conditions.